The five elements of earth, air, fire, water, and space are believed to make up brahman in the Hindu faith. Upanishad explains that “From Brahman arises space, from space arises air, from air arises fire, from fire arises water and from water arises earth”. Brahman represents the divine and ultimate god. Any pollution done to the earth is equivalent to polluting the divine god. However, in other instances the divine being is too pure to become polluted, but It is important to know that there is no distinction between the natural world we observe, and the divine. Dharma is a duty the hindus go through to serve the idols of faith. This duty can also be interpreted as partaking in rituals or as a responsibility for taking care of the environment. 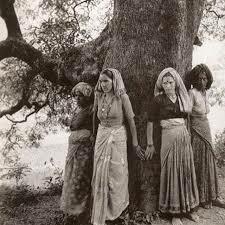 An example of Dharma is the Chipko movement, made famous by the Chipko tribal women who hugged trees in order to protect the forest against loggers. These women were fulfilling a duty to protect the environment against destruction. Many hindus offer gratitude to the environment. Many touch the floor before arising from their beds in the morning, giving the divine thanks. Communities such as the Bishnois, Bhils, and Swadhyaya throughout generations have retained strong communal practices to protect the environment. These practices aren’t oriented to conservation, but rather intended as an expression of Dharma. An example of this is the Bhil community, practicing rituals in sacred groves. They protect these groves as if they were god, and not as an intended environmental activist movement. All of this is an example of serving the gods in a ritualistic manner, without harming the environment. However, there are negatives that are produced from Dharma. One example is the ritual of submerging idols into waterbodies for worship. This practice is harmful to the environment because of toxic plaster and paint thats washed into the water. Three hundred fish are dead because of this practice in a pond located in Kandivali. This is a common phenomenon that takes place in hindu rituals. They take part in these rituals to celebrate the many idols of faith, but in doing so harm the environment which is equivalent to harming Brahman, the most divine. Another example of this act is the pollution of the Ganges river. Millions of Hindus take a retreat to the holy river to bathe in its sacredness, but will refuse to believe that any pollution has taken place in doing so. This is because they already recognize the river as holy and deem it impossible to pollute. Many will leave their clothing in the river to symbolically leave behind their old values. Diwali is known as the festival of lights. Many will buy fireworks and shoot them off for 5 days straight. I observed this during my stay in the Andamens islands, people were shooting fire works at each other and were playing loud music out of giant speakers. I would also witness the occasional parade filled with drum beats and dancing. These parades would be decorated with large deities. Following the parade were people dancing and throwing confetti. This ritual was ironic to me because it celebrates one god, but however harms the air quality which is a main element to the makeup of Brahman. Diwali symbolizes driving off of darkness and ignorance. The purpose Celebrates harvest, as well as, honoring the goddess of wealth (Lakshmi). This festival is another example of a festival that creates mass pollution. If millions are setting off fire works then this will drastically decrease air quality in large cities. Holy, another hindu celebration, creates pollution with harmful dyes that are thrown into the air and at people. Traditionally these dyes were natural powders made from Neem, Kumkum, Haldi, and Bilva. Now, many of the powders are developed from “acids, mica, glass powder and alkalis, and are quite capable of causing serious skin complications and allergies” (Gardner, Impact of holy on the environment). These dyes are more affordable on the market, and can be massed produced affordably rather than the traditional organic dyes. Bhogi is a traditional hindu celebration that honors Lord Indra (god of clouds and rain). She provides good harvest to the land by blessing the people with rain. RSPM levels go through the roof during this celebration, because of the ritualistic burning of old objects. This burning symbolizes the ushering of a new beginning, however the past still lingers in the form of smog. In the traditional sense this celebration had the history of burning organic natural material, but now society has drifted towards burning plastic and other unnatural chemically made products. When combusted these products become extremely harmful to not just the environment, but to human beings as well. Hinduism contains good motives in conserving the environment, as well as, take part in elegant celebrations to give thanks for what the gods have blessed them with. However, in some instance these celebration can be extensively harmful to the environment. It is crucial for the hindu community to fulfill their ritual needs while still pertaining to the health of the environment. The great social leaders of India such as Mahatma Ghandi have represented a motivation for many to take care of the environment. He practiced simple living, along with routine morning walks to appreciate nature, fasted to be closer to god, as well as, not to be wasteful. He was abhorrent against waste, and many environmentalist take inspiration from Ghandi’s work. Serving god was first, “conserving the environment” was second. We need more pro environmental spiritual social leaders like ghandi that can influence society into being conscious of both aspects of the environment, as well as, ones spiritual health.